Add yolks, salt, seltzer water and chicken fat (or oil) in a medium sized bowl. Add matzo meal, mix in. Whip egg whites until soft and creamy white, not totally stiff. I add them my 4 cup food processor and press grind for 1 minute. Or – whip by hand with a whisk. Add the egg whites and dill – mix well until all is combined. Cover the bowl with plastic wrap and refrigerate for 45 minutes until cold. About 15 minutes before rolling the balls – bring a large soup pot with water 3/4 the way full to a boil. When boils add 1 teaspoon of salt. Have a wax paper lined tray ready – using a 1 1/2″ cookie scoop, lightly oil hands (or with chicken fat) and roll onto 1 1/2″ balls. HINT: lightly roll, do not overwork the mixture. Continue with all the mixture lightly oiling hands, and place all the matzo balls on the tray. Add the matzo balls to the boiling water and cover tightly. Boil the balls until fully cooked through and tender – about 60 minutes. Try not to open the cover, this will reduce the water temperature. Test one matzo ball by cutting into it with a knife to determine doneness. 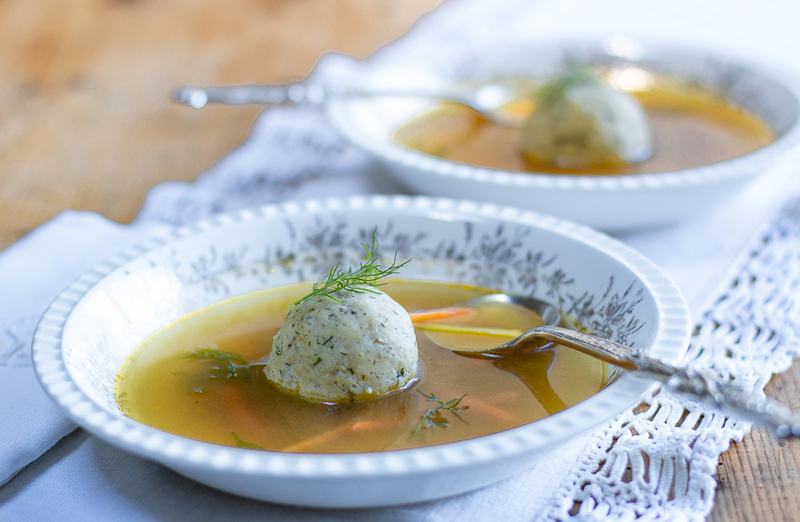 Remove matzo ball with a slotted spoon to a large bowl of col water to cool. |Can be made a day ahead. Store in an airtight container and refrigerate. See BLOG for major photos and instructions.